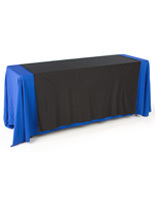 These Cheap Table Skirts are Runners to Fit 6' to 8' Long Tables! 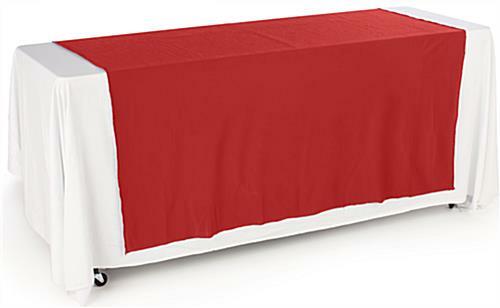 These Table Throws Grab Attention with Their Red color! 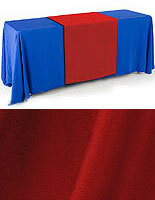 Bright red polyester cloth is attractive yet durable. 60" wide runner adds color to a presentation. Fabric is both machine-washable & iron-safe. 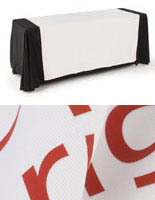 Plain table linens let you personalize a display with your own logo. These cheap table skirts are runners that drape nicely down the front of a rectangular table. At 80" long, they fit most standard-sized portable tables. The red table covers, cheap table skirts will stand out against the contrasting table linens traditionally provided by event coordinators. 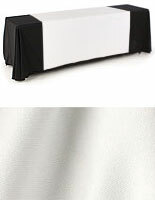 Our company offers these cheap table skirts without printing, which gives you more display options. Use these cheap table skirts to add a blast of color that makes your exhibit table stand out from the rest. If you prefer a custom printed table skirt or runner, check out our main page and find just what you need! 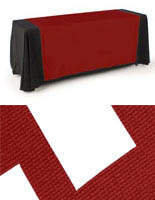 The cheap table skirts are available with personalized heat transfer vinyl logos. Just send us the artwork! 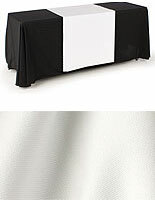 These cheap tablecloths may be used in many places including trade shows, seminars, banquet halls, and holiday fairs. Cheap table throws or runners are designed for use with contrasting colored table skirts. They are made of red polyester fabric to create an eye-catching and rugged tabletop display that draws the attention of everyone. 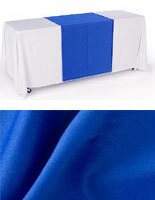 Cheap table skirts, also known as table covers or tablecloths, are 60" wide and are ideal for portable 8' long tables. They are also a great accent piece for the smaller 6' long tables. Buy now and make a bold statement at your next trade show!